Joseph Medicine Crow, a Native American historian and the last war chief of the Crow Tribe in Montana, died Sunday in a hospice, the Billings Gazette reported. He was 102. Medicine Crow, or “High Bird” in the Crow language, was known for his works on Native American history, including his own documentation of his tribe’s firsthand accounts of reservation life. The National Park Service also credited Medicine Crow as the last surviving person to have heard oral accounts of the 1876 Battle of Little Bighorn, including stories from his grandmother’s brother, White Man Runs Him, who served as a scout for Lt. Col. George Armstrong Custer. “I always told people, when you meet Joe Medicine Crow, you’re shaking hands with the 19th century,” Herman Viola, curator emeritus at the Smithsonian Institution’s National Museum of the American Indian, once said of Medicine Crow. Medicine Crow was born Oct. 27, 1913, on the Crow Reservation near Lodge Grass, Montana. He graduated with a master’s in anthropology from the University of Southern California in 1939, the first member of his tribe to earn a master’s degree. In 2009, President Barack Obama awarded Medicine Crow the Presidential Medal of Freedom, the nation’s highest civilian honor, for his work on Native American history and wartime service for the U.S. Army during World War II. 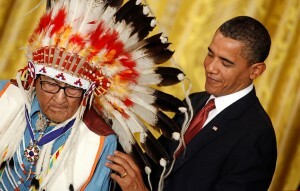 “Wearing war paint beneath his uniform and a sacred feather beneath his helmet, Joseph Medicine Crow completed the four battlefield deeds that made him the last Crow war chief.” Obama said at the White House ceremony. The White House credited Medicine Crow with stealing 50 horses from a Nazi SS camp, an act that met one of the four requirements — stealing an enemy’s horse — for war chief. “Historian, educator and patron, a good man, a ‘bacheitche’ in Crow,” Obama added. Montana Gov. Steve Bullock took to Twitter to pay tribute to the war chief. “Medicine Crow’s legacy will forever serve as an inspiration for all Native Americans — and all Montanans,” the governor tweeted. After the war, Medicine Crow was named tribal historian by the Crow Tribal Council. He was awarded an honorary doctoral degrees from his alma mater and Rocky Mountain College in Montana. He was also once nominated for the Congressional Gold Medal. Gloria Morrison Medicine Crow, Medicine Crow’s wife of more than 60 years, died in 2009.